Join an ever growing community of upscale property owners coming to one business for a full line of rental and property management services. We can help you rent out your home for just one week... or the entire year! 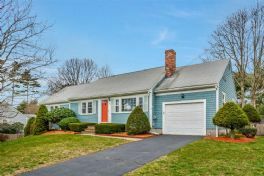 Cape Cod homeowners are switching to Sand Dollar Realty to handle the needs of their rental property. Customers know that our experienced staff can handle all aspects of managing your property; from weekly rental check ins to cleaning to emergency repair calls. Our level of dedication assures owners that their home will be well taken care of. Enjoy a beautiful and distinctive listing that shows your home at its best. You can't get fifteen high-quality large images listed on many vacation sites nowadays, however, at SandDollarOnline.com its all part of our incredible service to you. Your listing is 100% free when you join SandDollarOnline.com to list your property. That's right, completely free! You only pay when we are succsessful in renting. One of our staff will meet with you, go over the amenities and features of your property, take photos, help you determine the appropriate rental price and answer any questions you may have. Be confident that your home will receive unparalleled exposure on the Internet. Not only do you get an exceptional listing on one of Cape Cod's premier vacation rental Websites, but you'll also get your listing posted throughout the Internet by our staff. We pride ourselves on our high tech capabilities that help us reach customers throughout the world. We constantly monitor and update a variety of sites to make sure your home gets maximum exposure. Have your own SandDollarOnline.com owner account . Stay up to date with all of the reservations we have made and the payment status of each one. Plus, you'll get all the property management services Sand Dollar Realty has to offer to make renting a headache free experience. a) We will let the tenant know what to expect and what is expected of them. b) We collect a reservation deposit by cash check or charge. c) We escrow a damage deposit, and return it pending a satisfactory check out. d) We check your tenant into the property and make sure that everything is as they expected. e) We will respond to any complaints or needed repairs using our vendors or yours. f) We will check out your tenant and encourage them to pre-reserve for the following season. g) Lastly, we can have our cleaners prepare your property for the next tenant, or coordinate with your cleaner. Call us today at 508-888-1106 or Click here to email us to have us contact you about your property. Make some extra money on those weeks you would otherwise be empty.